There’s one word shared often amongst SEO experts and VidCon panels – consistency. Instead of putting all of your effort into one viral video, creators need to adopt an “always on” approach and make sure they are consistently available to their community of fans. But what types of content should I be making? How often do I upload? YouTube was happy to answer those questions in their Creator Handbook by introducing their Hero, Hub, and Help content strategy. It’s YouTube’s way to show brands and content creators how they should approach content creation on the site and why chasing viral content is the wrong thing to do. To understand this content strategy, imagine a pyramid (see above). 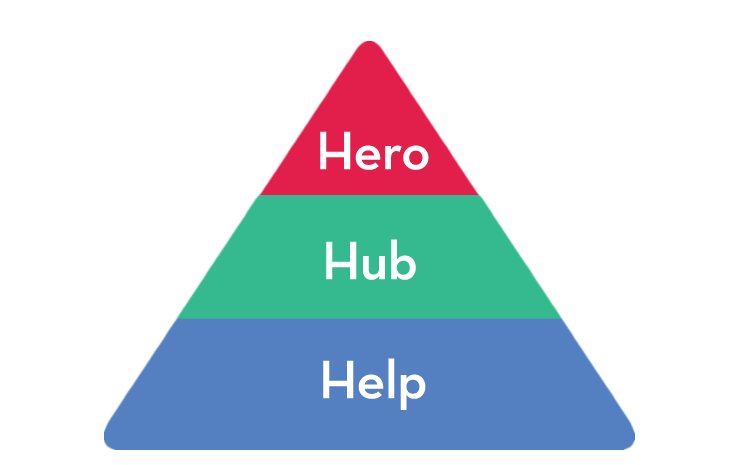 Looking from its peak, you’ll first find Hero content, followed by Hub and finally Help content at the bottom, as each of these attempts to meet a certain objective.